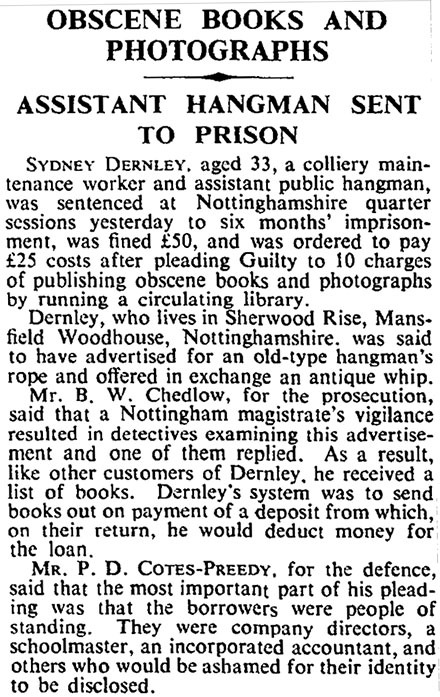 On this date in 1950, Norman Goldthorpe hanged at Norwich prison. Goldthorpe’s was an open-and-shut case. In a drunken fury when his married lover ditched him for the hubby, Goldthorpe tracked down a 66-year-old prostitute he knew and strangled her to death. Neighbors had seen him coming and going. Because the realm’s veteran lead hangmen, Albert Pierrepoint and Stephen Wade, had been engaged for an execution in Scotland, the job fell to Harry Kirk. Kirk had been an assistant executioner, a job that entailed helping measure the drop of the rope and set up the gallows, but he had never been the head executioner. That job required actually noosing the prisoner and throwing the lever to drop the trap. The difference wasn’t merely one of degree, but of kind … as Kirk (and Goldthorpe) unpleasantly discovered. Syd Dernley, the assistant executioner turned memoirist whose career we’ve touched on before, was Kirk’s number two. As he recalled, the whole engagement started off in, er, mortifying fashion. A feeling of apprehension hit me in the stomach. Think about that one the next time you recollect your worst faux pas. Well, this wasn’t even Kirky and Dernley’s worst of the Goldthorpe job. After fretting a nervous hour away while the body dangled for the regulation time, the hangmen finally got a look at what went wrong: the linen hood tucked over the man’s head in his last instant of life had snagged in the eye of the noose, and jammed it up before it could tighten all the way. In Dernley’s estimation, the rookie hangman botched it by going too fast. Pierrepoint, who had hundreds of executions to his credit, was famous for his lightning-quick hangings, with nary a wasted motion. 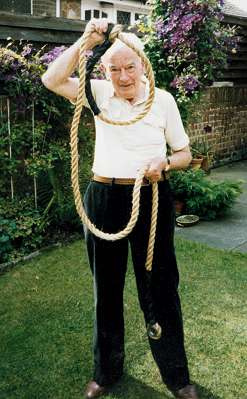 Dernley relates one instance where the master, in a showoff mode, lit a cigar and set it down before commencing the hanging procedure, and was in time to pick it back up for a puff before it went out while his prey twisted at the bottom of a taut rope. But Pierrepoint’s speed, which helped define the Platonic ideal of an execution for Britain’s last generation of hangmen, was not an end unto itself but a product of the master’s expertise. It was the last hanging Harry Kirk ever worked.